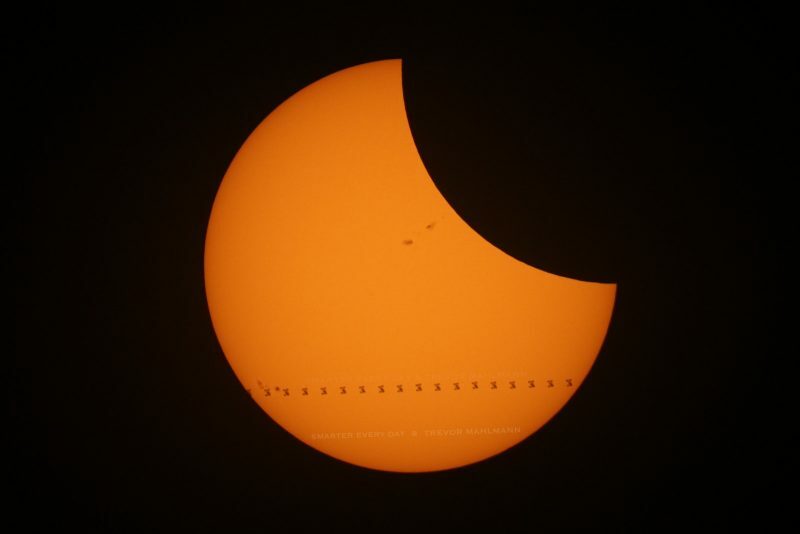 There was only one part of Earth where you could catch the International Space Station crossing the sun’s face during the August 21 solar eclipse. These guys saw it, and created this video. During the August 21, 2017 solar eclipse, the International Space Station (ISS) passed three times through the penumbral shadow of the moon on Earth. Astronauts aboard ISS captured images of the moon’s shadow on Earth, as did other earthly spacecraft. During the eclipse, people using the right equipment – and located in the right place – could catch the fleeting pass of ISS across the sun’s face. That pass was seen from a very thin ground track from California through Canada. Meanwhile, there was only one place where you could witness both a transit of the ISS across the partially eclipsed sun and the total solar eclipse later in the morning; it was at the intersection of this transit path with the moon’s shadow path in Wyoming. The video above – from Destin Sandlin at the educational video series Smarter Every Day, and from professional photographer Trevor Mahmann, who earns his living in part via his Patreon page – shows that ISS transit. It’s an amazing video and a tribute to our modern information world. It’s only now – through information sharing and combined knowledge – that such things as videos of ISS transits across the sun’s face during eclipses have become possible!